Hotel Tech Report's mission is to speed up the pace of global innovation by making it easier for hoteliers to discover and adopt new products (and thus easier for vendors to sell their products) by creating transparency in the market--so when it comes to our own policies and methodologies, we like to practice what we preach. Remember, the Hotel Tech Score isn't meant to place judgement on vendors, it is meant as a way to help bring transparency to the market by incentivizing vendors to share product information and customer reviews with hotel tech buyers to help them make better, faster and more informed decisions. So if you have a great product that customers love, you're going to love the HotelTechScore. If you don't, its never too late to work on improving your product and/or customer service. Customer ratings: How do your customers rate your products and services (aka. customer ratings)? Review quantity (aka. minimum review threshold): Do you have enough customer feedback to be useful to buyers and comparable within your category? Additional criteria: The HT Score continues to evolve and incorporate over time so variables such as globalness (# of countries your reviewers come from), review recency, customer engagement (# of requests sent to customers), reported install base and more continue to be incorporated into the HT Score to help add more meaningful signals of quality over time. Remember, the Hotel Tech Score is just a way to take all of the feedback and thousands of data points from users and boil it down into one simple number to help buyers be able to quickly skim the site and find the best tech for their hotel. Want to improve your HotelTechScore? Want to manually calculate your HotelTechScore to check it? While it only contains the critical variables (and thus won't be 100% exact), it will be within +/- 3% of your score. 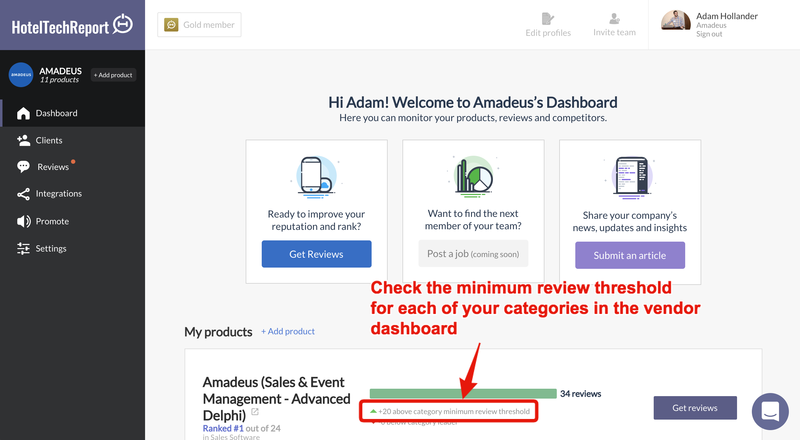 Make sure you are above the minimum review threshold in each of your categories. If you are below it is negatively impacting your HotelTechScore. Just like you, our community of top hotel tech vendors, we value feedback so don't be shy! If you have ideas of how you think we can improve the Hotel Tech Score, please let us know via the on-site live chat.